Filibuster is a semi-cooperative game where you work together to stop a crazy political agenda all while trying to gain the most influence amongst the other players. Players will take approximately 30 minutes to block 4 out of 7 policies from being enacted. Putting all politics aside, this is a fun and semi-educational game. Politics included, it is a very political game. You'll be starting Twitter wars, overhearing conversations, catering meals and even kissing babies. 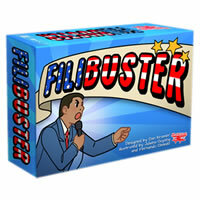 Learn more about the game Filibuster and add this unique game to your collection today! Review Completed (2017-08-23) So we'll have to admit that we were a little nervous signing up to review this game since none of us are super political people. During unboxing the game and a quick glance at the rules with all the political references we thought, "oh no, this is going to be torturous." Fast forward 15 minutes worth of watching the "how to play" videos and we were bursting with anticipation and excitement to play. Putting all politics aside (literally), to anyone who is hesitant about this game due to its political theme, don't be. Once you get over the tiny hurdle of political jargon it is hilarious, fun, engaging, collaborative, slightly educational on how filibusters/politics work, strategic and different every time you play. Not to mention the cartoon art is wonderfully done with diverse ideas. The amount of effort and attention to detail really shows through with this game. Filibuster is an exceptional game where players are torn between helping everyone advance in the game or being greedy to help themselves. Because after all, if four policies are released, everyone loses and the game is over. We really like this aspect and how it put a strategic twist on the game. The rules as they are now could use some improvement but that might be on the producer's list before this game is fully released (pictures/examples are needed similar to their campaign page). Like any great game with an addictive and high replay value, the rules are moderately complex but are quickly learned once you get in the swing of things. We also loved the random good and bad things that can happen in the game which totally throws a wrench in what you're trying to accomplish sometimes. Think you're on the path to winning – think again! Filibuster is definitely a great game that almost everyone will love. We even saw some slight look-a-likes in cartoon character depictions with real politicians and current references like "covfefe." Perhaps people get burnt out with politicians and politics in general but this game makes it fun since you get to be one! Players must successfully block 4 out of 7 policies from being enacted and accrue the most influence during the game to become the winner. 109 cards, a game mat, 69 punchboard influence tokens, 2 punchboard voting tokens, 1 punchboard difficulty tracking token, 3 wooden cubes and the official Filibuster game rules and instructions. Please keep in mind that the official Filibuster dice-card rules and instructions could be different depending on the game version you have. 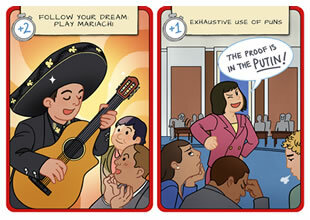 The rules below are some of the exact directions on how to play Filibuster. Share with us your comments, funny stories, tips, advice, strategies, creative ways to play, questions about how to play, problems with the rules or anything you want about Filibuster. All submissions will be reviewed within 24 hours. Click here to add your Filibuster comments.